I appreciate the kind words Dziada. What is the highest value cargo trailer you can own? Including singleplayer, I reckon Special Transport DLC. On MP, it's probably stuff that has the 'High Value Cargo' in-game, possibly along with a combination with fragile cargo. Try doing that on a HCT trailer if possible because then you would have the most of that specific cargo. You also have to remember that there is a huge number of reports, especially on a server such as EU2, and the GMs simply don't have the time or resources to deal with this. You press Y to open the chat, watch out because if you drive with keyboard you won't be able to control your truck then. To talk on the CB radio, you hold X to talk. You most likely coupled a caravan with a truck or a car with a regular trailer that is meant for a truck. It's against the rules and it's an autokick, hence why you got kicked. If you want to wait for a good traffic jam wait for a Real Operations Event, hopefully one will come out again. The C-D road is packed but nobody there follows road rules so you'll most likely just get annoyed instead of experiencing proper RP. It is not coming to TMP. It's only for the event team. 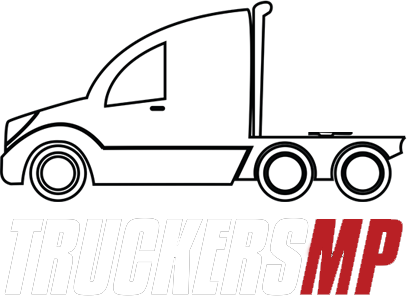 How are there 2 million registered users on truckersmp if the "total members" thing on the forum says otherwise? @Miko [PL] Jest tam podana dzisiejsza data oraz to że dzisiaj będzie Q&A. This is the most noticeable if you drive at high speeds and then brake really harshly. The damage on your truck will be on the tyres, as said above ^^. So even if you crash sometimes, the damage will not increase because for example you damaged your engine or chassis, but you already had more damage than that on your tyres. This is most likely due to the time sync between your game and the time on your servers. In Singleplayer, when you are not in the game, the time does not go forward, on multiplayer however this is not the case. The time carries on going therefore your time is not synced with the server time, which means that you are late. You can sync your time in multiple ways, for example sleeping, teleporting to a different garage or service station. After you do that, then take a job and the problem should be fixed. Polecam system TrucksBook, bardzo dobry. Niestety na TB nie można stworzyć własnych rang we firmie, na VT można.